This combination of strong lines and incredibly intricate detailing is gorgeously demonstrated by the Art Deco 1/4 Carat Diamond Ring in 14K Two-Tone Gold. Strong lines are evident in the graceful lotus flower that rises from this ring; the gleaming petals of this stylized bloom form the setting for a glittering round quarter carat diamond. Contrasting this blossom in both color and texture is a band that exemplifies the intricate detailing that was prevalent in the 1920s. A meticulously-carved leaf and swirl motif dances on this 14K white gold band, creating a look that’s lively and feminine. Like all two-tone engagement rings, this piece uses the contrast between two colors of metals to emphasize the details of its design. 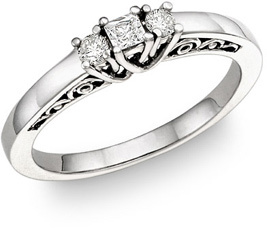 Strong lines are also clearly seen in the Vintage Art Deco 1/4 Carat Diamond Ring. This striking ring features a quarter carat round diamond, held by an architecturally-inspired setting that seems to sweep up to meet the gemstone like the beams of a graceful vaulted ceiling. Every detail has been attended to in this expertly-crafted 14k white gold ring. Its elegant open design is both airy and substantial, making this an ideal piece for expressing a love that makes you feel light as a feather and yet that has the ability to ground you in any storm. 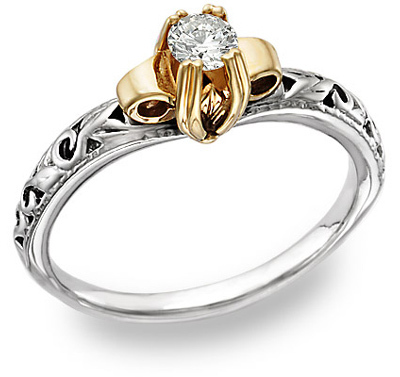 Swirls are a common motif in Art Deco engagement rings, and the 1/4 Carat Art Deco Diamond Engagement Ring incorporates these designs into a classic three-stone style. Three princess-cut diamonds, one larger stone hugged by two smaller gems, are the focal point of this classy ring as they glitter above a shining band of 14K white gold. However, this isn’t an ordinary three-stone ring. When viewed from the side, a graceful swirling motif is revealed, giving this piece a sense of playful elegance. Art Deco designs aren’t only popular in stand-alone engagement rings; they’re also making a splash in coordinating engagement ring and wedding band sets, such as the 3/4 Carat Art Deco Diamond Wedding Ring Set. The geometric shapes that were popular in the 1920s give this dazzling pair of rings a glamorous personality. A round 0.26 carat diamond serves as the center stone of this set, and it’s surrounded by a double halo of two squared-off frames of smaller stones. 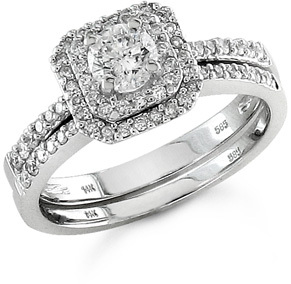 Additional diamonds stud the matching bands for a look with undeniable sophistication. 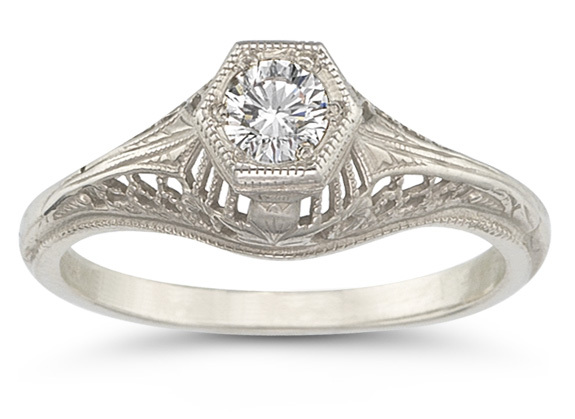 Vintage diamond rings with Art Deco designs are excellent options for popping the question in style. The time-honored looks of these pieces are perfect for celebrating love that will endure.